Today officially kicks off National History Month and there is a lot to celebrate! A few generations back, in 1930, my family could provide for 10 people (according to Crop Life Ambassador Network) and today my dad could feed 130 people (I’m not sure how many cows that equals). However, this month is not just about celebrating where we are today but celebrating where we come from. I come from Benjaminville, Illinois-founded by my great-great-great grandfather John R. Benjamin. While Benjaminville, known today as Bentown, is an important part of my family’s history-it does not define our history. My family’s history is defined by their beliefs. Benjaminville was founded as a Quaker Community. Quakers do not believe in war. They also believe in equality for different races and women, even at a time when this was a rarity. Therefore, black people lived in Bentown because they knew they would be treated well. Women were respected leaders within the Quaker church. These are important values that my family has preserved to pass down to me. My family’s history is defined by kindness. A poor gypsy family buried their son on our land because they could not afford a burial plot at the cemetery. My great-grandfather would adopt an orphan boy from the community. My grandmother would call a widower across the way each morning to keep him company and have him over for Sunday dinner each week. Ingenuity is also an important part of my agrarian heritage. John R. Benjamin, the founder of Benjaminville-regardless of what Wikipedia says, once got lost coming home in the sea of prairie grass (or perhaps it was just dark). He found his way home by following the familiar bark of his dog and later would plow a “road” to Bloomington, Ill. so that it wouldn’t happen again…. as family legend goes t this was essentially the Oakland Ave. Bloomington knows and loves today. Also, my grandfather was an early adapter of terraces and contour plowing. My dad can remember the USDA hosting a tour from Washington DC to see his farming practices. And yes, my family even has small claims to fame: John R. hired a German immigrant to work for him and in return gave him a tract of land. One day this land would be farmed by his nephew-George J. Mecherle, founder of State Farm. John R’s brother, Rubin, was given his bar exam (to practice law in Illinois after the family relocated) by none other than Abraham Lincoln! The local history museum states that Rubin Benjamin was instrumental to antitrust legislation that limited the power of railroads. Bentown also was home to a semi-pro baseball player at one time. This list is just a small cross section of the values and stories that make me proud of my family’s agrarian history. I also posted some of the pictures of the last two generations of Benjaminville. I hope to post other pictures throughout the month as well. This is a picture of my dad, George Benjamin, in front of our old combine. It might not be the newest or shiniest but it gets the job done and there is something to be said for that. There is also something to be said for worn out blue jeans and dirty shirts that represent a hard days work. This is our tractor, in the back you can see some of our outbuildings on the original farm. We call the red building pictured the shop building. My brother and I used to explore it to see what family treasures we could find, including an old fashioned horse drawn sleigh! 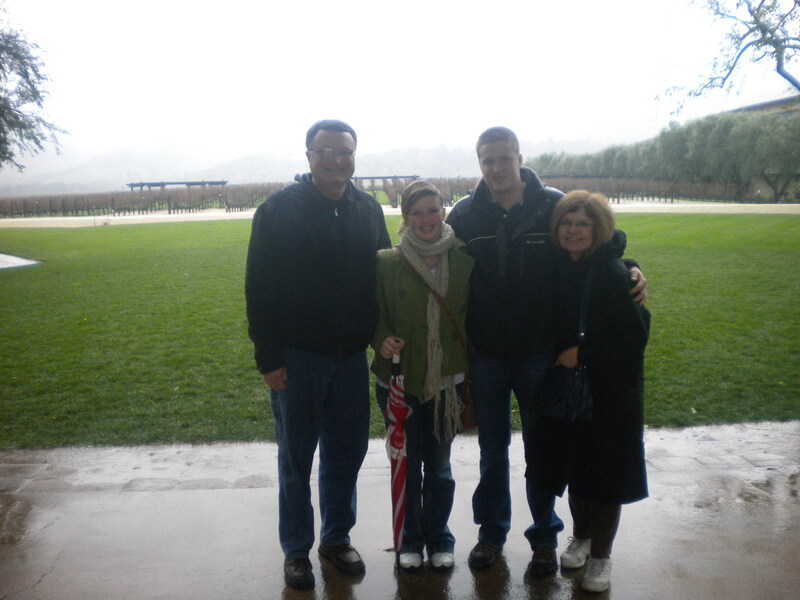 Two generations of Benjamin siblings at Napa Valley.